Tired of grappling with business data stored in various locations whenever you need to make charts in SharePoint before presentations? 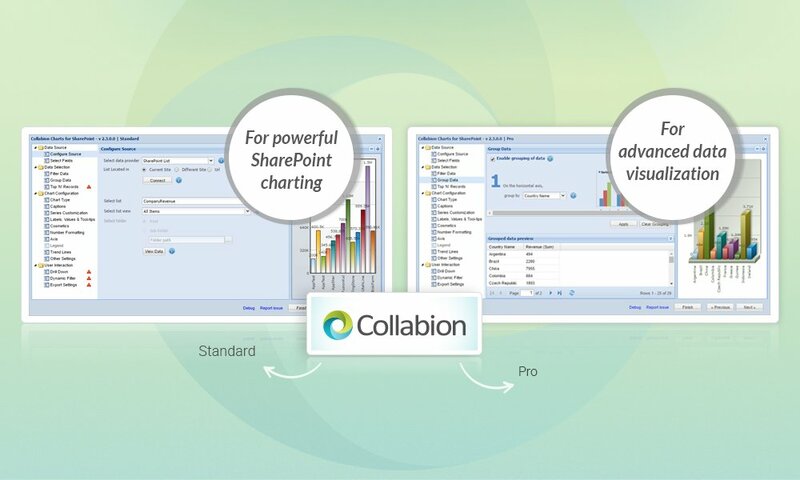 Then this is the best time to check out Collabion Charts for SharePoint. The recently launched latest version (2.3.0.0) of this popular enterprise charting solution is available in two powerful modes, one available for free (Standard), and the other available via an annual subscription (Pro), either of which can make your life easier in more ways than one. For starters, here’s what you can expect from the Standard mode. Got multiple data sources? Connect away! Do you need to make charts in SharePoint from data stored in various locations and platforms – from SharePoint lists and SQL Server/Oracle databases to good old Microsoft Excel? Collabion offers out of the box support for all those, plus more (including BDC, CSV, and also other sources via ODBC connectivity). Not sure whether your data will be best shown as a line chart or a bar chart? Want to show the yearly profits with a waterfall chart? Not a problem. With as many as 56 chart types at your disposal, finding the one that works best for your data will take just a few minutes. Want to upgrade to SharePoint 2016, but not sure whether charting with it will be just as hassle free? Relax – we have got that covered. The latest version of Collabion offers complete support for SharePoint 2016 and lets you build charts quickly and efficiently, just like you always have. You’re welcome! You will hardly ever be able to prepare charts directly from a data source, without first slicing and dicing the data. With Collabion, you can apply filters to the data with the help of user-friendly wizard. Data grouping is also possible, with the aggregate functions SUM and COUNT. You can also apply filters to a data source after you have built chart(s) from it. The chart will be updated automatically according to any change you make to the data. The Pro version of CCSP can connect to SharePoint filter web part or HTML form web part, which can be used to create custom filters that show data based on criteria that you define, add empty records wherever there are gaps in the data (so that charts do not have empty spaces and look weird), and so on. While the Standard version gives you access to aggregate functions SUM and COUNT, the Pro version goes much further, letting you use the functions AVERAGE, MIN, and MAX as well, to extract the data you need for your charts with pinpoint accuracy. The Pro version of CCSP lets you apply multi-level drill down to data. When you build a drill down chart, clicking on one of the dataplots of the chart opens up a separate chart with more in-depth insights about that section. For instance, you might build a drill down chart with the amounts of revenue your company has earned on a daily basis for the last 10 years, and represent each year with a bar. Then, clicking on any bar will open up a second chart with the bars representing month-wise data. Clicking on one of the bars representing month would then open up a third chart, showing daily data. With the Pro version, you can do this up to the n-th level, extracting more and more actionable insights from the data. Simply need to fetch the data from the first n rows, or first n% rows of your data table? With the Pro version of Collabion 2.3.0.0, you can do this in seconds. CCSP 2.3.0.0 lets you export any chart you build, as part of an Excel workbook or a PowerPoint presentation, as pictures in the formats JPG and PNG, or even the ubiquitous PDF. What’s more – just a few clicks and you can even print the charts you build, directly through Collabion. The Pro version of Collabion comes with Priority Support, which ensures that in the rare occasion when you run into any kind of trouble while using CCSP, one of the developers of the software is there to help you out. The best part? No matter which version you download (Standard or Pro), you get Priority Support for one whole month. After that, you will receive queued support with the Standard version. If you decide to go with the Pro version, however, you will continue to enjoy the benefits of Priority Support. So, what’s your pleasure? Do you want to try out the powerful features of Collabion with the free version, or do you want to make a smart investment in the pro version, one that you are never going to regret? Touch base with us here to discuss options.